How do you edit someone's hierarchy?how to set manager or subordinates for user? To edit user's hierarchy simply click "people sign" under his profile picture in Gallery. To the left you will see the Hierarchy builder panel with the list of employees. Simply type the first name, last name, position, department, email or phone number in the Find user field. Drag the user from the list and drop on his future manager. now the user from the list will be a subordinate of the person that you've dropped him on. *NOTE: Drag'n'drop works from hierarchy builder panel in one direction only. You can not Drag'n'drop the user back to it or move one from subordinates to the top and make him a manager. 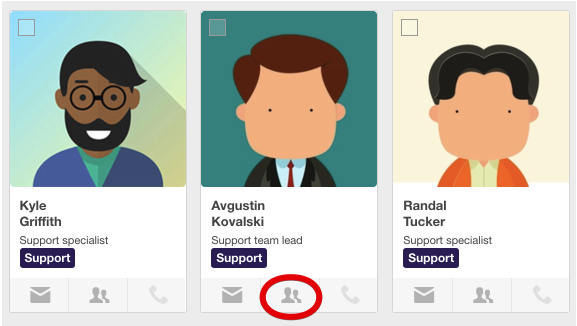 To change a subordinates position or unbound connection between him and his manager you must delete the connection by clicking a cross on his picture. Then he will get back into the list of users to the left. After this you can drag'n'drop him again where needed.